Truly unique skirt belt with full length ruffle fringe for costuming. 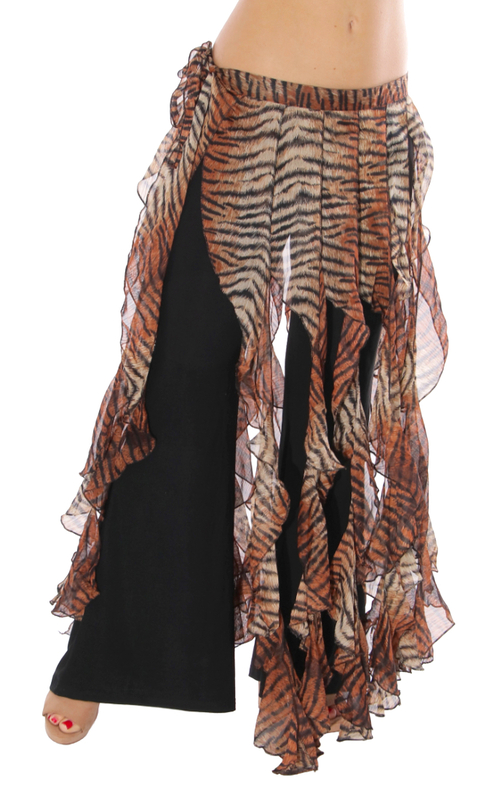 Add some dramatic texture to your wardrobe with this unique brown, tan, black and white tiger stripe print over-skirt! This lovely skirt / belt with full length ruffle fringe is an awesome piece for belly dance costuming! Also looks great over skirts, pants, or shorts! Tie closure for adjustable fit. 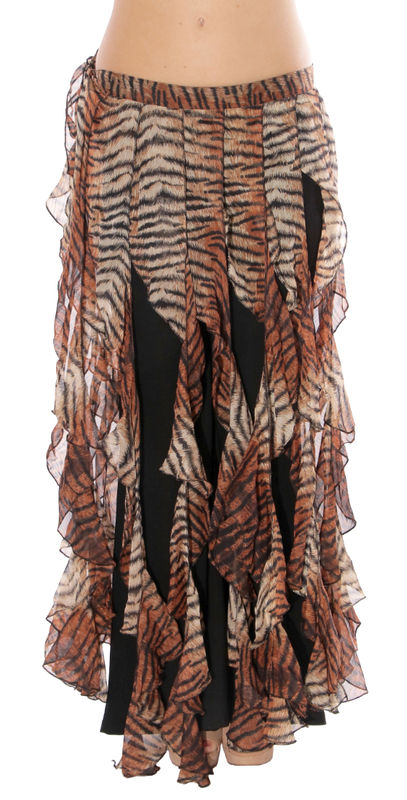 I actually ordered this Ruffle Fringe Skirt Belt-Tiger to layer over a re-purposed prom dress for a masquerade ball costume. It worked perfectly!! The shipping time, quality of the item and the great price points were outstanding!! I will definitely order again! Keep up the great work! I wore this for a burlesque number with a black corset and black sequin leggings. I'm 5'7" with long legs and it was long enough! I got lots of compliments, and the pictures look great. My first animal print piece, and I love it!! I LOVE this skirt belt. It came sooner than I expected and everyone in my bellydance class is envious. My instructor was impressed with the construction. I recommend this to every dancer - belly or not. This skirt is beautiful i feel like the queen of the jungle when i used. Awsome!! !